At would seem to me that you are listening. Feeling them and seeing synchronicity is a way of receiving communication. Don’t limit yourself by believing that the only way you can hear your guides is the same way you hear another person talking to you. This situation reminds me of a passage from Conversations with God where God states that speaking directly to you in a human language is the absolute last resort and, additionally, the most limiting way that God can speak to you. God goes on to talk about how it talks to you every day, in a multitude of forms, if only you would listen. And by “listen”, it doesn’t mean with your ears. It means listen with your heart. You don’t need to hear your guides clairaudiently to be able to receive messages from them. They communicate with you through synchronicity, through feelings, through those seemingly random conversations you have with yourself in your head while you’re driving, in your dreams, the incredibly well-timed phrase on the television that caught your attention or the line in the book you’re reading that made you stop in your tracks. They speak to you in symbolism and it’s all around you, every day. All you need to do to listen is open your mind, remove expectation, and receive. If you’ve been around my blog for the last year, you’ve probably noticed a lot of changes. I redesigned the entire thing, then I redesigned my homepage, like, four times, the most recent of which I just launched last night. Check it out if you haven’t already! I had a reading with my friend Jenn early last week and she suggested that I make my healing practice/readings the main focus of my website instead of just my blog, and I thought it was a good suggestion. So that’s what I did! I’ve still got a few things I want to tighten up here and there and a few things to add when they’re ready to launch, but the general look, feel and flow is all here. I feel like I have SO MUCH creativity right now – so many ideas floating through my head. So much to do! So much I want to do! It’s hard not to feel overwhelmed, but in a good way. Every time I check something off my to-do list, I end up adding something else. As my husband said, “Well, you’ll never be bored.” True that. Long story short – look for lots of fun things to come! I’ll make announcements as they come closer to fruition. Humanity has lived in fear long enough. It’s time to shift the paradigm and understand that the things in the world around you only have power over you if you let them. Being afraid of these things is putting yourself in agreement with powerlessness. There is nothing to fear. Love is the greatest power there is and that is within you, always, even when you refuse to acknowledge it. The way to let go of fear and take your power back is to begin to understand the way you are creating and participating in your experiences. It means taking on responsibility for your thoughts and feelings and how that energy plays a part in your every day life. An important part of this is dispelling common myths and misunderstandings that no longer fit within the new paradigm. – Any other duality-based belief that suggests that the universe contains anything other than pure, unconditional, unadulterated love, particularly any beliefs you hold about yourself or others. Holding onto such fear-based beliefs is counterproductive to your ability to see love in all things. It is also counterproductive to your ability to move into a state of love and anchor that energy down here to earth. What you have to realize during this process is that you are making an active choice to believe in such things – and you are making an active choice to live in fear of these things, and you are actively choosing to give your power away to those things through your belief in them. The biggest rebuttle I often see to that point is, “Well I have EXPERIENCED this or I know someone who has, so you can’t tell me it’s not real.” I never said it wasn’t real – it’s very real, in your own inner-environment. And it’s partly real because you believe in it and are creating it and it’s partly real because you are CHOOSING to view that experience through a lens of fear, instead of viewing it neutrally. And the fear you felt in that moment very much played into creating the experience. Belief creates reality, and if the reality that you wish to create involves these things, then your belief in them will allow them to exist. As long as you refuse to accept that you are a creator of your experiences, you are actively choosing powerlessness. If you wish to create a reality without those things, you can do so just as easily (and dare I say, it may be a somewhat more enjoyable reality). 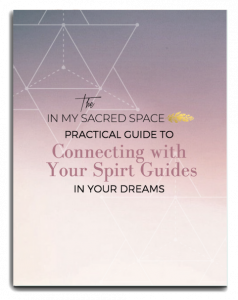 I received a follow up question from yesterday’s blog post on spirit guides. My higher self would be the combination of all of the identities I’ve ever been. Each one of those incarnations are a unique expression of my higher self. My spirit guide, Bill, for example (he named himself, it’s lame, I know) – was alive with me back when I was Lakota (or maybe it was some other life as a Native American, but I learned about the two of them around the same time so for simplicity’s sake, we’re going to assume it was that particular life). And now he is one of my primary guides for this incarnation. I have a second primary guide who came in later who calls himself Nathan. Nathan shares a higher self with someone who is currently incarnate that was a major player in my life 10+ years ago. As I understand it, Nathan and this person also have another identity expression named Cailon, who is also some sort of guide for me, who also shares a higher self with the other two. Additionally, Cailon identifies with a person who I was best friends with in a past life – a young girl. But that girl also, at times, shows up as a separate entity. All of these spirits – the little girl, Cailon, Nathan, the person who is living right here and now – they are all expressions of the same higher self, presenting as different identities, and they do exist individually, for lack of a better word, over there. Each of those identities probably come from various lives lived here and there – some not even on Earth.